As a side topic I do collect also protection letters & passes from the Holocaust which includes documents issued and signed by several “righteous diplomats”. But to get the chance to secure such a early document of Jewish-German-Polish history is outstanding! This folio protection letter for a Jew from Poland with name Moses Lewin from the City of Lodz (profession: tailor), received the Royal protection and the right of residence for him and his family, issued on order by the King of Prussia. The document is sealed and dated 1799, and written in German with Polish translation. The only other document like this I saw at a recent visit this March at the Jewish museum in Berlin, Germany. But I have to say their document is in much more worse condition. Mine is, considering it’s age, in excellent condition with a completely intact and crisp seal. I tried to get in contact with researchers there during my visit to discuss the topic – but unfortunately they were not flexible at all and I even had the impression they were quite arrogant in dealing with my request to met a responsible researcher at location. What a pity. However I am pretty lucky and happy to found this significant document of Jewish-German-Polish history. 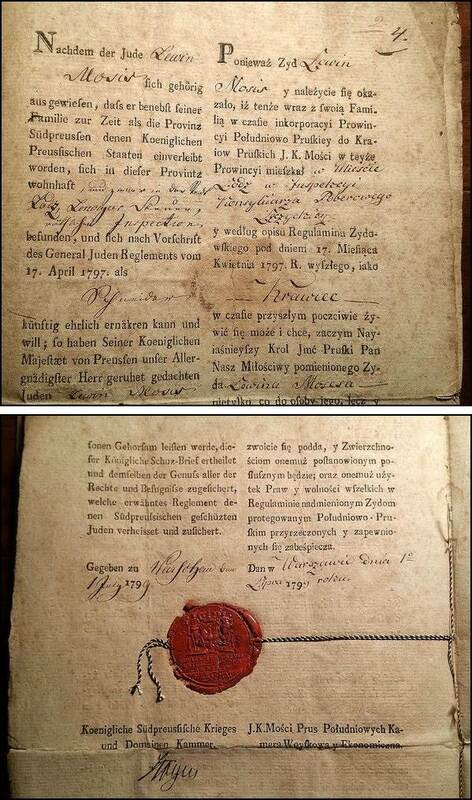 Prussian protection letter for a Jew (Schutzjude) issued 1799 with fully intact & crisp wax seal. The repressive Prussian laws introduced in former Polish territories were directed against the Jewish proletariat. There were a number of restrictions which, among other things, aimed at forcing the Jews out of the country as long as they could not produce evidence of possessing appropriate wealth. The General Ordinance on the Jews (General Judenreglement) of April 17, 1797 divided all Jews into those ”protected” ( Schutzjuden), who were obliged to know the German language and possess a sufficient amount of wealth, and those who were merely ”tolerated”. This ordinance limited the rights of Jews to settle in the countryside. It also ordered the removal from the area those Jews who could not prove that they had resided in a given town in the territory of the partition zone at the time when this territory had been annexed to Prussia. The same regulations were introduced in the Grand Duchy of Poznan which had been part of the Duchy of Warsaw before the former was joined to Prussia. Equal rights for all Jews came in 1848, when the differences between the two categories of Jews were abolished. Later, in 1850 , Jews were given the same rights as the remaining subjects of the king of Prussia. It should be added incidentally that the legislation which accorded certain privileges to those Jews who spoke German was conducive to assimilation. On the other hand, a large number of those who could not speak German, had to leave the country. The constitution of the Duchy of Warsaw, by abolishing differences between the estates, introduced formal equality of all citizens. In spite of this, it provided for a number of restrictions in relation to Jews. For example they were forbidden to work in certain occupations and the granting of full rights to them was made dependent on their cultural and traditional assimilation. The Jewish question became the subject of extensive discussion. Some authors accused them of selling cheap, poor quality products. To this the outstanding economist, Wawrzyniec Surowiecki (1769-1827) replied: ‘‘It is not the fault of the merchant or the craftsman that he supplies the country with this sort [of goods], but it is the result of the poverty and misery of the inhabitants who can afford nothing better. Were this sentence not true in relation to Poland, the Jews, together with their humble goods, would have soon gone bankrupt.” In such discussions one could easily discern interests of the burghers who were afraid of competition from Jewish merchants and craftsmen and therefore were in favour of restrictive measures against the Jews. The overwhelming majority of Jews in the Duchy of Warsaw were poor and made their living from petty trade and crafts. Only some succeeded in accumulating wealth. Of the latter, the leading place undoubtedly goes to the family of Samuel Zbitkover (1756-1801) who laid the foundations of his fortune in the final years of the Commonwealth when he was engaged in provisioning the army. Then there was also the banker Samuel Kronenberg whose son would play an important role in the country’s economic and political life.